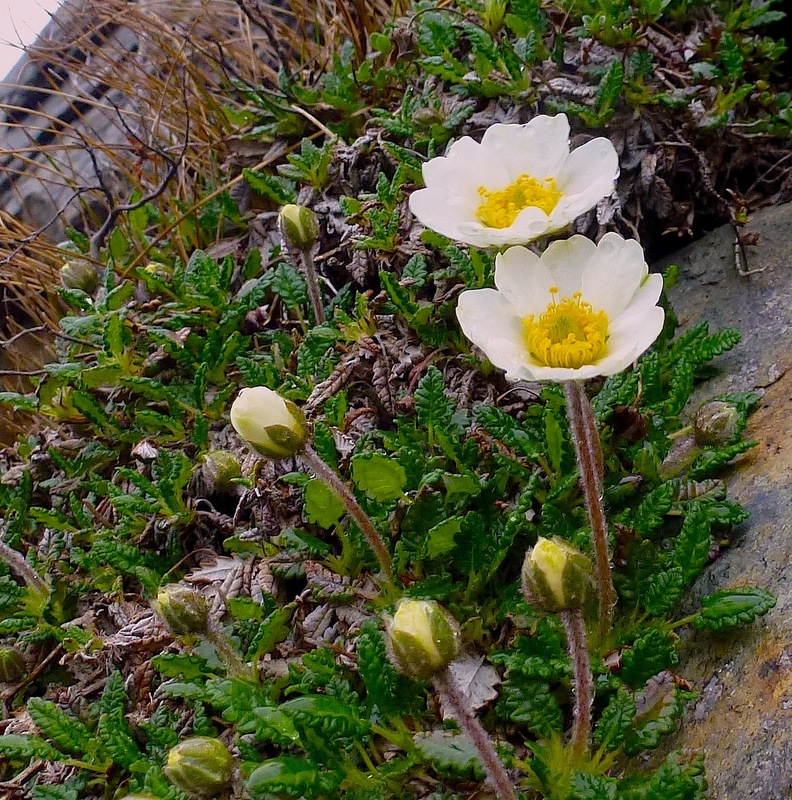 Below are some of the more common arctic-alpine flowers you might come across. This succulent, hairless plant forms a dense cluster of grey-green stalks bearing purple-tinged, and toothed, fleshy leaves. The flowers form in dense, flat-topped clusters of yellow-orange blossoms. 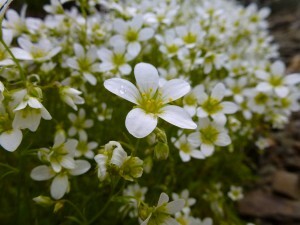 They can be found flowering from May onwards and enjoy lime-rich rocks, meadows and screes. 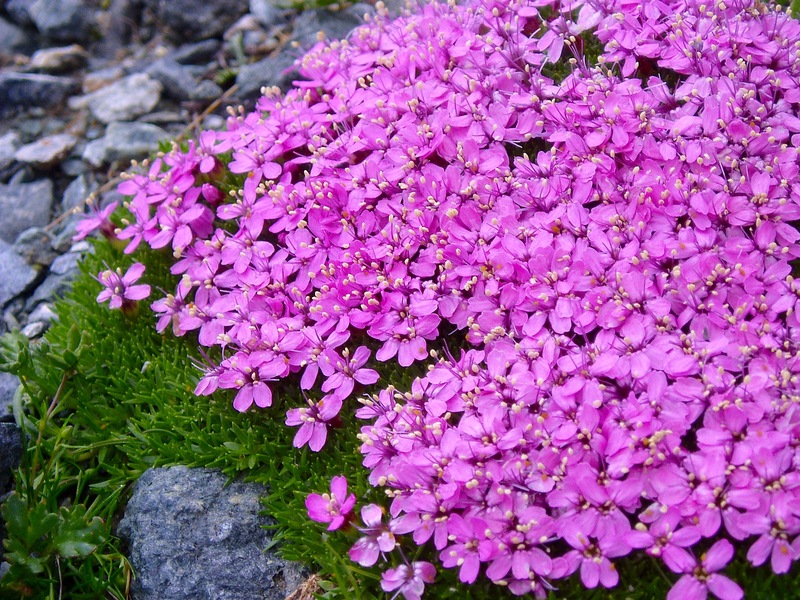 Roseroot is found in scattered places across the Alps to 3000m and also across the Arctic. In Britain it is found in Northern Ireland and from the Scottish Highlands to North Wales. Its roots have a rose-like fragrance and have been used as a perfume and also in medicine. Its reputation as ‘natures viagra’ increasing sexual vitality has made it popular and it is marketed in Finland as ‘northern ginseng’. This cushion forming plant is again found in base-rich habitats. The dense cushions thrive on inhospitable barren ground. The close knit, moss-like cushions keep low, away from the drying winds and a strong taproot anchors the plants to the ground. 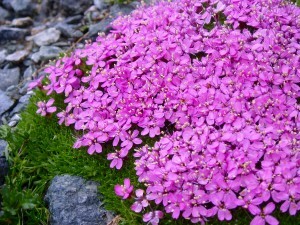 The pink flowers can be seen from May until August and its British distribution is confined mainly to Scotland although they cling on to a few high mountain ledges and screes in Snowdonia and in Cumbria. It is found at sea level on sandy shores in Orkney, and at 1305m on Ben Macdui! Like so many of the alpine flowers, Moss campion is found around the circum-polar arctic region and throughout the Alps. Cowberry is a heath plant found throughout the upland areas of the British Isles. It has delicate white, open bell-shaped flowers from May onwards ripening to an edible, red berry from late August. This creeping, evergreen heath plant has dark green, glossy leaves and an extensive network of roots. 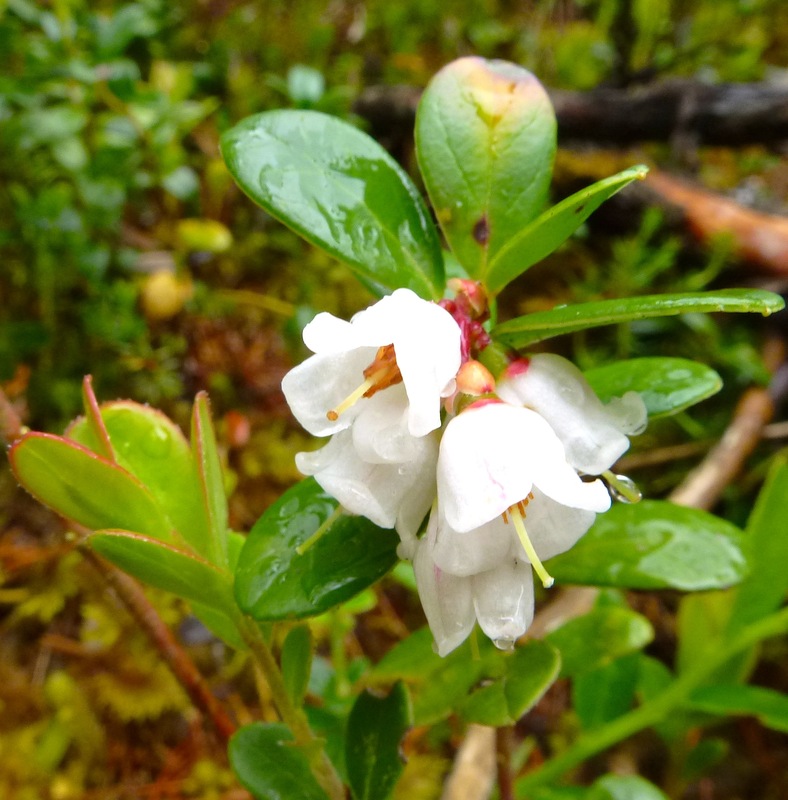 It is a widespread shrub enjoying pine forests on acid soils and upland moors. The solitary golden spheres of glossy yellow flowers appear on top of straight stems. The leaves are lobed and palm-like. It is a striking plant and has a preference for shaded, damp habitats away from grazing sheep. Again like so many of our arctic-alpine species it is associated with base-rich soils. It can be seen across Wales, northern England and Scotland on upland wet meadows, mountain cliffs and mountain woodlands. A hardy, evergreen pioneer plant with large white flowers with 8 petals. Its leaves resemble those of Oak and has given rise to its scientific name ‘Dryas’ after the Greek for Oak. It forms a ground-hugging carpet with leaves green on top and a woolly, white underside. The large flowers ‘track’ the suns path in a process known as ‘heliotropism’. This is thought to concentrate the suns energy to help progress the seeds development during the short alpine summer. 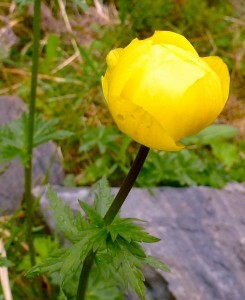 It is a less common arctic-alpine flower in the British mountains a rare sight in Snowdonia and northern England and in the Scottish Highlands. 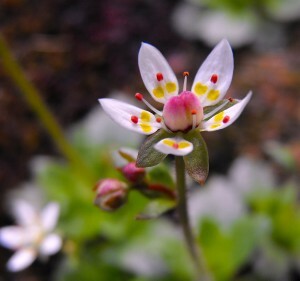 A striking plant with a five-pointed star shaped flower with 2 yellow spots on each petal. This is a more common arctic-alpine plant found in the British mountains and can be seen in mountain flushes, wet ledges and along mountain streams. The term saxifrage derives from Latin Saxum – rock and Frangere – to break. 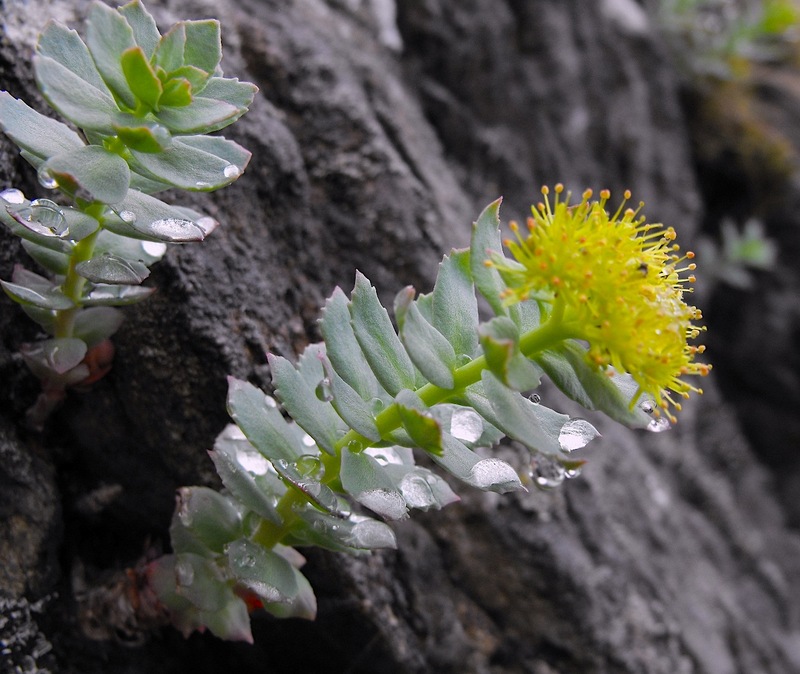 The plants are able to survive on loose screes and utilise the nutrients released when the intense cold shatters the rocks so a true specialist of harsh mountain conditions. Jim Langley is director of Nature’s Work which runs MTA approved courses for the outdoor industry.